The Last Pullman Car is now available on DVD. Purchase it here. 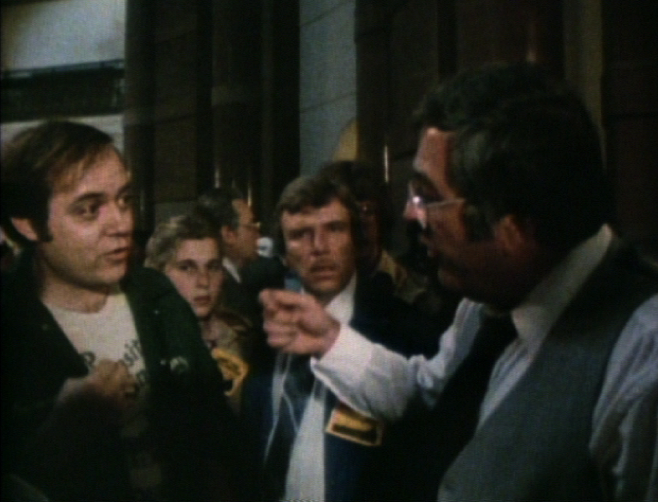 The award-winning 1983 documentary is about union workers fighting closure of a Chicago rail car plant. Capturing the workers’ struggle against elected officials, the Pullman-Standard Company and the national union, the 28-year-old film couldn’t be more relevant than in today’s harsh economic times. A new DVD feature shows the film’s main subjects emotionally returning to the building of the former plant to watch the film with an invited audience. One workingman from this audience asks them what lessons can he learn from their experience: “You know we have to start supporting people and the political arena that supports the working class,” one of the film’s subjects firmly answers. In 1981, the United Steelworkers Local 1834 tried in vain to keep the Pullman-Standard Company from shutting down its operations in Pullman, Illinois, putting several hundred people out of work. “The Last Pullman Car began when some of the workers approached us about the struggle they were in to save the last American manufacture of rail cars,” said Kartemquin’s Artistic Director and co-founder, Gordon Quinn. “Over the next few months we began to see that their story was a story about the future of America and they began to trust us enough to let us into the center of the conflict." The film, directed and produced by Gordon Quinn and Jerry Blumenthal, won First Prize at the Athens International Film Festival, an Honorable Mention at the 1984 American Film Festival, and screened at Chicago International Film Festival, Rotterdam and Big Muddy film festivals. Pullman Factory Today: Screening and Q&A with Film Subjects. Wisconsin Protests Governor's Union Busting. Historical Photographs of Pullman Train Cars. Study Guide from the Original Release. "This film is a battlecry!" "Never intrusive and avoiding obvious, human interest techniques 'Pullman Car' makes the members of local 1834 come alive on their own terms… By the time the film is over it's impossible to distance oneself from the plight of these workers who are being shunted aside by their company, by their legislators, and by society as a whole." "Succeeds in presenting a film from the workers' perspective. It draws the audience into an immediate concern for the men and women about to lose their source of livelihood. Perhaps this story is more appealing than other chronicles of laid-off workers because it is more than a tale of lost jobs. It is the loss of generations of skills. It is the loss of the last American company in the passenger railcar industry. It is a vivid example of a new America where economic and political policies insure that large corporations can make more profits closing down manufacturing facilities than operating them."